Pitt Athletic Director Scott Barnes takes in a practice alongside E.J. Borghetti during football training camp in August. Matt Hawley | Staff Photographer. Pitt athletic director Scott Barnes denied a report Wednesday night claiming he would be resigning and taking over as athletic director at Oregon State. But he has yet to deny reports that he is considering leaving Pitt. 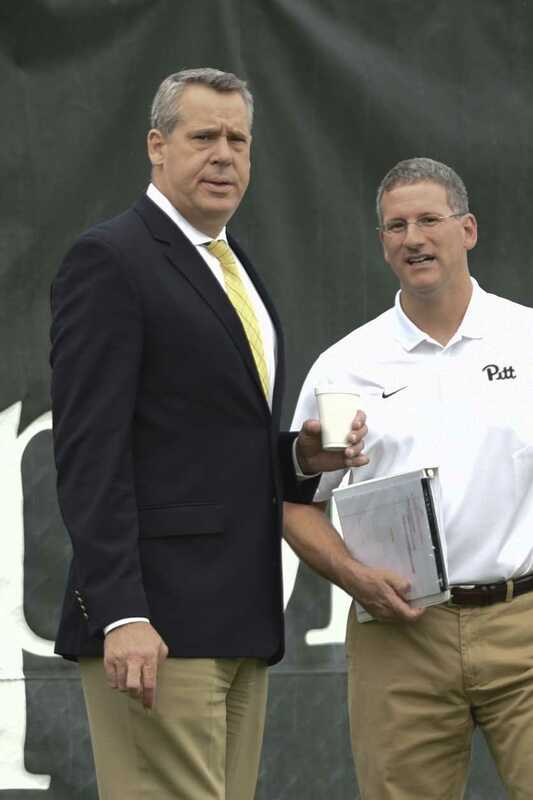 Barnes has served as Pitt’s athletic director since April 2015. But on Wednesday, rumors began spreading among Pitt insiders that Barnes was on the way out after less than two years. Pitt’s athletic department released a statement from Barnes Wednesday night via a press release. “I am aware of a report stating that I have accepted a position at Oregon State. That report is not true,” Barnes said in the release. But the Pittsburgh Post-Gazette reported later that night there was still a “strong possibility” Barnes would be leaving for Oregon State. University spokesperson E.J. Borghetti responded to a request for comment Thursday via email regarding the reports and whether Barnes was considering other options. “At this juncture, we’ll let last night’s statement stand regarding this topic,” Borghetti said. Barnes arrived from Utah State in April 2015 and instilled a strategic plan for the future of Pitt’s athletic programs. His new vision for the athletic programs included a return to the Pitt script logo and streamlined uniforms for all 19 varsity athletic teams, along with renovations to the Petersen Events Center, Fitzgerald Field House, Trees Hall and UPMC Rooney Sports Complex. In his time here, Barnes has spearheaded the massive rebranding effort while also hiring decorated head coaches such as Kevin Stallings for men’s basketball, Jay Vidovich for men’s soccer and John Hargis for swimming and diving, all with the goal of raising Pitt’s standing across all sports in the ACC and NCAA.